India or Pakistan: Who has the biggest, er, plume? – snackettes. A roar rips through the crowd…. Another roar, this time from a couple of hundred feet away. 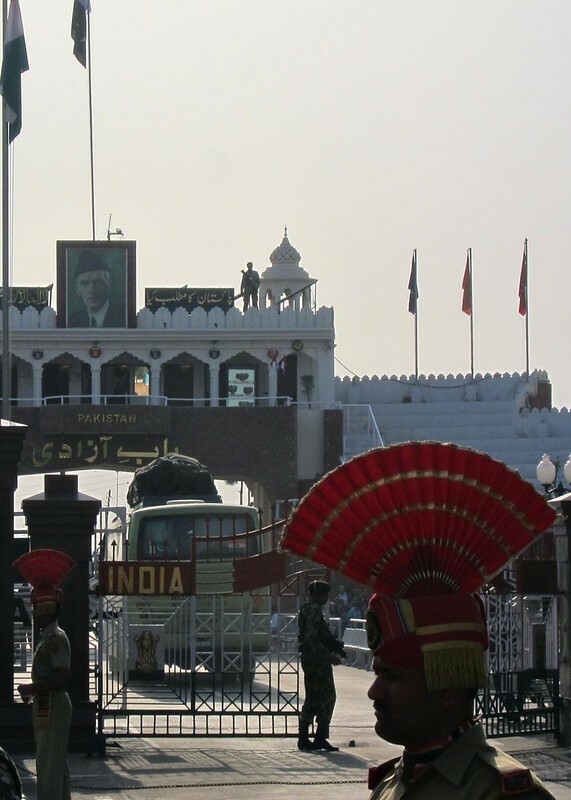 The announcements blare out at us from 2 men screaming into their microphones, each on their respective side of the border between India and Pakistan. And the roaring? That’d be the crowds of people packing into stadium seats who have come to cheer on their homeland in tonight’s showdown. When Pakistan broke apart from India to form an independent nation in 1947, a serious rivalry developed between the two countries that led to a gruesome period of violence known as the Partition. 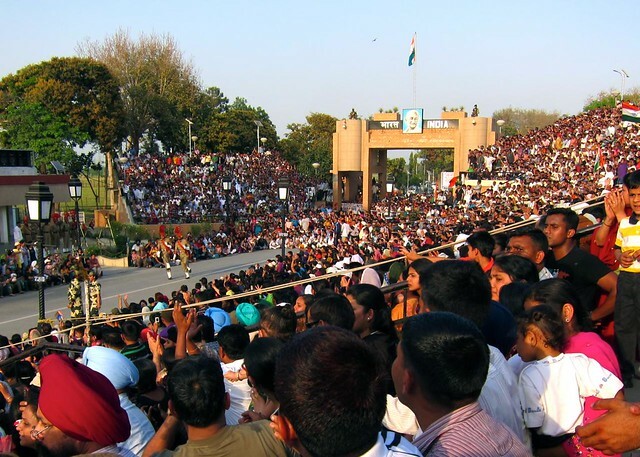 Although the border closing ceremony that now takes places between them every night is grounded in this bloody history, the nature of the competition has been toned down to little more than a playful back-and-forth where locals from each side come to duke it out each night. The purpose of it all at this point is anyone’s guess, but the event is a tradition that has gone on for years, and the excitement and fervor surrounding it today more closely resembles an American football game than a harken to a violent period of history. Amritsar, the city in which we’ve been staying for the past 4 or 5 days, is about 40km from the border of Pakistan, and afternoon shuttles leave from the Golden Temple every day to cart Indian and foreign tourists out to the Indian border town of Atari to experience this spectacle first hand. We hired a private taxi from the temple, and inside waiting to go with us was another Indian family of 4 from Delhi. It would be their first time attending the ceremony, as well. The ride out to Atari went quickly, likely due to our nervous small talk –where the heck are we?– as we neared the Pakistan border. The taxi unloaded us at a checkpoint in front of the border, and from there, we drifted apart from our new friends and joined hoards of others to walk the rest of the way. 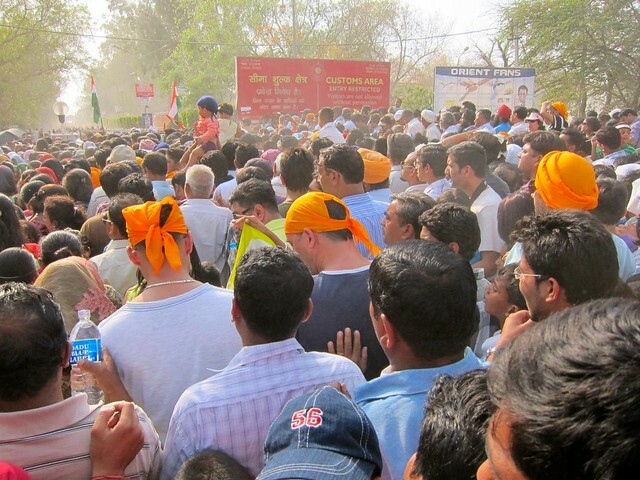 We reached a closed gate where we were told everyone would need to wait to be let in at once, and from a cursory glance at the bulging crowd, it was clear that waiting there could get dangerous in a hurry (despite our short time in India thus far, we had already experienced the common behavior in crowds – the pushing, the shoving, the cutting in lines – and the amount of people waiting behind this gate was only getting bigger). It seemed everyone around us was bent on getting to the front of the line, so we tried to stand as much to the side as we could and let everyone else sweatily elbow it out. We saw several women working their way out of the middle of the mostly-male crowd, disgustedly gesturing as if they’d been groped (an issue so problematic in India that public transportation in the cities often offers female-only busses and subway cars). After a 20 minutes or so, the gate was opened, and the crowds piled through in a Black-Friday-esque stampede. We saw a few people fall down and struggle to get back up, narrowly escaping tragedy. The worst part was, Steph and I had to be separated for the entire fiasco, as the border guards had decided to split the group up by gender, to avoid said groping and shoving by the men. As the men’s gate swung open, I tried to stay toward the back but got swept into the shuffle, fighting to stay standing and make it through the gate without getting trampled. Steph and I were finally able to find each other again, and we were both visibly shaken. Steph told me that once she got through the gates and turned to wait for me (in the men’s group), the 100+deep crowd of men were collectively pushing the gate open, causing the border guards to physically beat several men back with their batons! What was going on here??? …And she had been terrified that I wouldn’t survive the stampede that she was about to watch unfold. After Steph and I had both survived the first gate, everyone stopped and compressed into a pile again: we were at another gate. Steph was nearly in tears as she had to separate from me again as we had to pass through the gender-specific gates. The women’s line, while still very crowded and dangerous, appeared tame compared to the men’s. 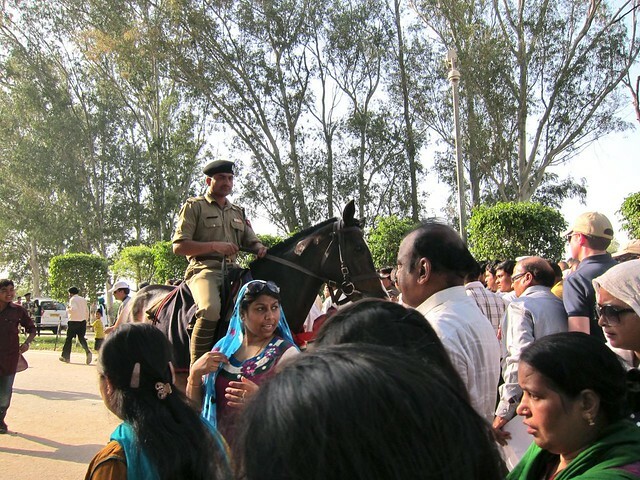 The men continued to compete to be first in line for the next gate, and in anticipation of some attempts to actually jump the gates, police officers with batons were stationed on horses at the front, beating men back whenever they came too close. Unfortunately this stop-and-go would continue for 3 or 4 more gates, with little kids getting smashed, saris ripped, hair clips pulled out, until we finally reached the border. At the final gate, we were (sorry to say, thankfully) segregated by nationality (residents versus foreign tourists), and along with a group of similarly-frustrated Europeans, we all calmly walked toward the front row seating area designated for tourists and took our seats. 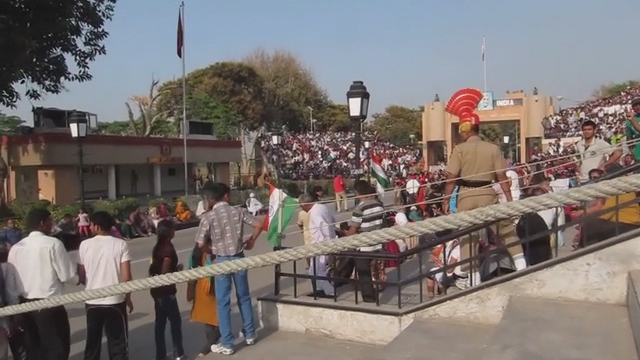 Large stadium seating flanked either side of a road that crossed directly between the countries, and soldiers with gigantic plumes on their heads marched up and down the streets. A large metal gate on the border line itself was closed tight, and soldiers on either side guarded it with guns resting on their shoulders. And there, we got our first glimpse of… Pakistan! 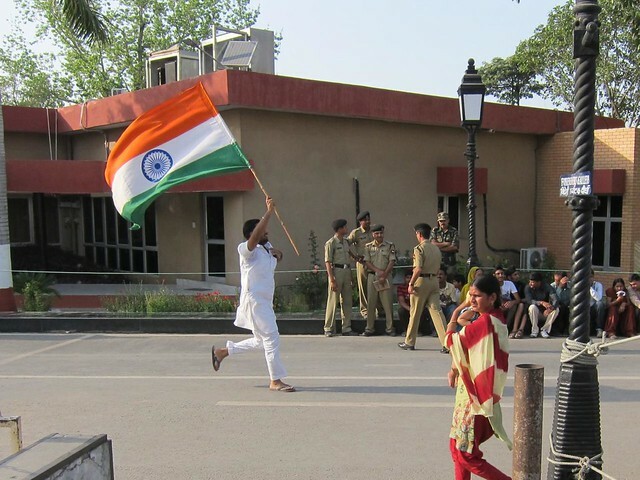 On the Indian side, Indian citizens took turns running a huge Indian flag back and forth in front of the stands, while the crowd roared in approval. Young groups of kids danced to blaring Bollywood club music, and the announcer prodded the crowd with call-and-response chants. After our over-stimulated eyes and ears had adjusted to all of the excitement, we finally turned out attention to the Pakistan side in the distance. The men, dressed in all white or light blue clothing, sat quietly, separated from the women, in one set of bleachers. Across from them, a rainbow of pink, green, blue, and red saris filled the other set of seats. The announcers prodded the crowd along, “Hindustaaan? ?” (the nickname used for the Indian side of the Partition), and “Pakistaaaaaan? ?”, both followed with cheering from their respective crowds. The Pakistanis sat quietly at first, watching the Indians run, dance, and cheer, and we wondered when they would join in the raucous banter. One by one, soldiers on each side lined up to take the microphone in a bizarre game where they would attempt to hold a “aayyyyoooooooo” note for as long as their breath would allow. When a soldier ran out of steam, he or she would high-step dramatically forward out of the line-up and march towards the border. When they reached the closed gate, each soldier would do an extra hard couple of stomps and high kicks, trying to intimidate the other side’s border guards. The crowd cheered for the soldier’s efforts, and the other side would follow suit, first trying to hold a longer “ayooo” before stomping it out at the gate. For the record, Pakistan consistently held a longer ayyoooo. This game went on for 30 minutes or so, at which point all soldiers from each side had given a yell and stomped to the gates. 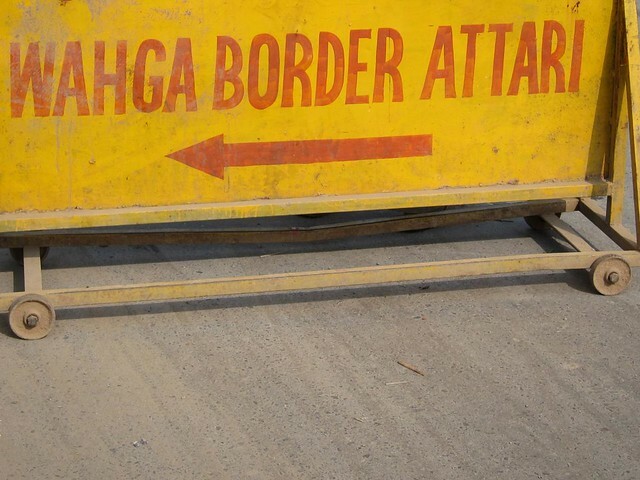 The guards dramatically threw open the gate separating India from Pakistan (there was now nothing stopping us from hopping to the other side!! – save for those M16s pointed at the neutral territory). Once the gate was thrown open, the soldiers alternated in a more personal showdown of stomps directly in front of the other country, sometimes even high-stepping over the line, which was received by the crowd as an even more aggressive taunt. The ceremony concluded with both sides lowering their flags and loudly slamming the metal gates shut. By this point, the Pakistanis had upped the volume of their cheering tremendously, far out-crying their Indian counterparts by the time the ceremony came to a close. As we filed out of our seats to leave, we turned to wave to the Pakistanis just on the other side of the gate. It was strange to think that these were a people we would never get a chance to meet, standing in a land we would never be allowed to enter, living lives we would simply never experience or understand. So who was the winner of the India/Pakistan showdown that day? We had to hand it to the Pakistani women, who were hooting, hollering, and stomping it out far louder than anyone else. Well played, ladies. 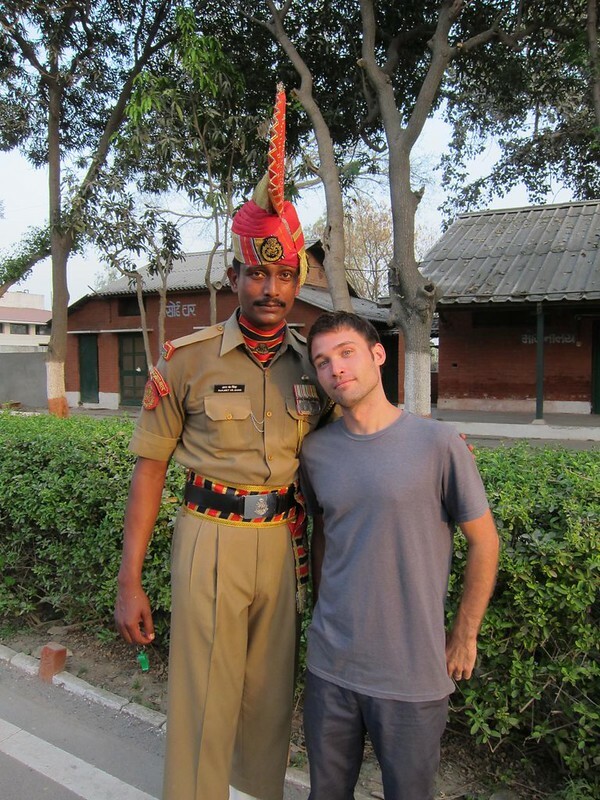 Posing with the Indian announcer and border guard…. These reports are fantastic, guys! You are becoming true citizens of the world! Thanks for sharing your adventures with the rest of us.